I am waiting, tonight, for my love to come home. Thunder. And downpour. And a route she travels because I asked her to. JAMC Darklands, the soundtrack. Apropos for the deluge making my decision to suburban-up and mow Monday a legitimate act. Rice simmers. As I learned from Jose those 14 years ago in Paris. Sauté onion, then dry rice, ONLY then add liquid. Less than Uncle Ben, or Cousin Billy, would suggest. Olive & Sesame (oil but not Popeye, and oil but not Street) await shitake, oyster, cremini, honey. Jalapeño for heat. Cilantro to accompany. Basil to tame for sweet. Cabbage and spring onion because I have cabbage. And because it is spring. I pray she comes home safely to me. 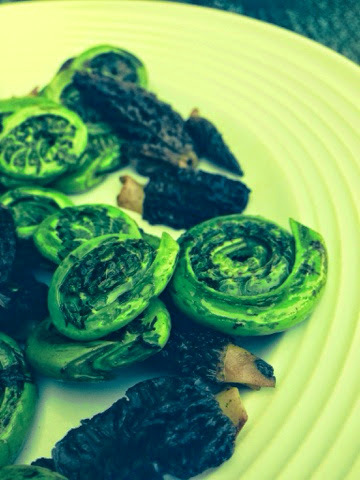 Fiddlehead ferns and morels met, stainless steel, heat, and butter for a few moments. A brilliant amuse buche for family this holiday Monday. This is the view I have when we eat dinner outside. I'm sure there are many other images I've saved since I last posted here that triggered some desire to write again but weren't heeded. Maybe that will change. Somehow this morning is a little different. There's coffee (normal), and time (rare), and another writing project I'm working on that has my brain juicing (uber-rare). Plus, I sat outside as the sun set (that photo is fairly due west) and ate my grilled bacon-wrapped chicken and asparagus; washing it down with a damn-fine Torrontes we've found at one of the wine-bying options on my way home from work. And that was a nice way to end my day.